One thing I enjoy while traveling is finding little differences that make it apparent you’re in a new place. It reminds me that as interconnected and small the world sometimes seems, people have still evolved in parallel and not intersecting. They have found their own ways of doing things and seem happy to continue doing them that way rather than conform to what another part of the world has come up with. So I thought it would be fun to pass on a few of these little things as I encounter them to highlight new experiences with the German way of doing things. Radio – Moving from Missouri to DC, I was excited about hearing lots more variety of music on the radio. Instead I found a world of Clear Channel owned stations that features lots more ads and less variety so I almost exclusively listened to my own music in the car. Here in Germany I enjoy listening to the radio again because the stations are so eclectic. Sure you get Top 40 like Maclamore’s Thrift Shop every so often, but you also hear a wide variety of songs in German, French, (British) English, etc. Traffic Lights - The lights here go from green to yellow to red just like in the US but before changing back to green, they give you a little heads up by flashing yellow a few times while the red stays solid. This is helpful in a place where so many people drive cars with stick shift. Also, many new German cars will shut their engine off when you come to a full stop to save fuel and then restart it when you let off the brake (or depress the clutch) so it gives you that extra second to be ready when the green comes. Not that they're nearly in the hurry DC drivers (and Kristin) are to get to the next stoplight. Airports - I've never waited more than 10 minutes to get through security and you just go through a metal detector with your shoes on. If you bing, they quickly wand you and wave you on. Fewer people are rushing around and with smaller limits on carry-on luggage, fewer people are toting two or three bags around. 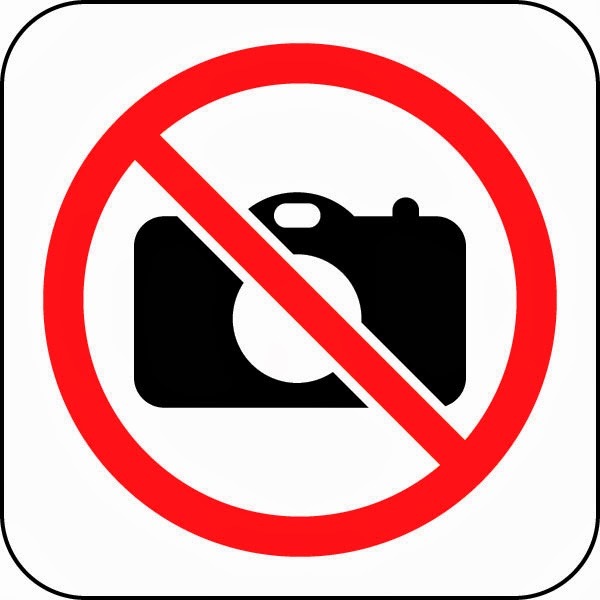 Best of all, there isn't a cocophony of "special security announcements" every 5 minutes and CNN blaring from TVs at the gates. Smoking - Cigarettes and smoking are much more prevelant here. While in Japan we saw vending machines everywhere despensing food and drinks, around Stuttgart we see cigarette machines. There's even one attached to the apartment building next to ours in case anyone walking by needs to get some. Many bars also have smoking areas but fortunately they are confined to a separate room. Airports also have large smoking lounges sponsored by tobacco companies. It's not a big deal to me but coming from a city with so few smokers, or places to smoke, I have become hyper sensitive to it. It's nowhere near as bad as the bars in my college town! Salads - While Germans love their meat and potatoes, I have been impressed with the salads that often accompany such a combination. Instead of the standard lettuce mix with a tomato on the side I'm used to, they often give you an interesting assortment of veggies and even include beets and/or potato salad. Which is nothing like German potato salad I see in Missouri but still good. Some doubted this post would ever appear...like little kids waiting for Santa himself to show up. Better late than never, right? Just a short 2.5 months ago Christmas market season was in full swing once Kristin got back from spending Thanksgiving in Boston. We love Christmas so we used it as an excuse to explore some towns around Stuttgart, buy some presents, and drink Glühwein. 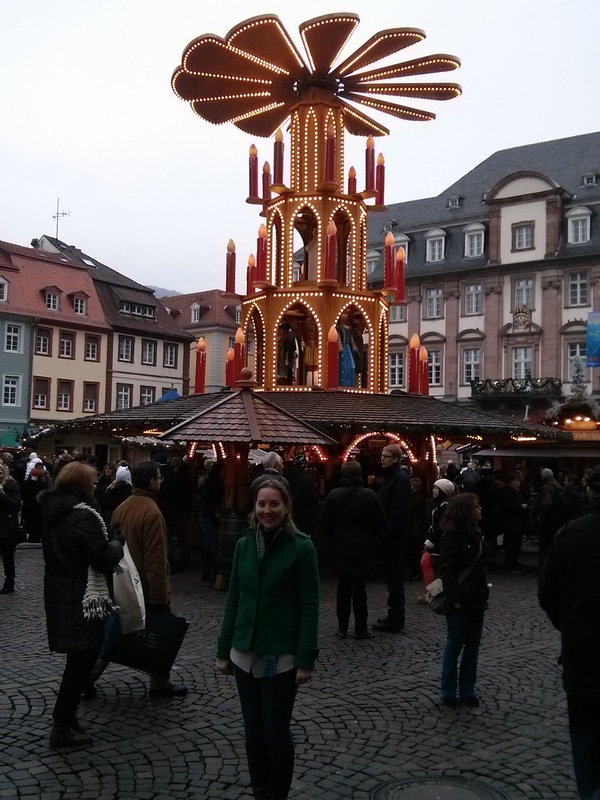 Wasting no time, I picked Kristin up at the Frankfurt airport and we stopped in Heidelberg on our way home. This is a neat old town set on the river with a castle overlooking it from the hill. I had briefly visited the town a few weeks earlier but otherwise didn't know much about it. So we just parked in what looked like a central location and followed the crowd. After strolling down a pedestrian mall nearly a mile long, and stopping for some Glühwein to warm up, we came across the main part of the market filled with little wooden huts selling crafts, food, and other such items. Kristin still had a bit of jet lag 3 days after flying back, but when I told her the Tuesday night run was ending at a chocolate festival she was all in. After a very short trail, the group finished in the main square that was filled with tents selling all forms of chocolate. Technically this wasn't a Christmas market (the chocolate only lasted a week and then evolved into one) but there was a lot of overlap and it was fun to see another nearby village. "Bad" translates to "bath" and Bad Cannstatt is a city district just across the Neckar river where hot springs form mineral water baths that Germans enjoy relaxing in. 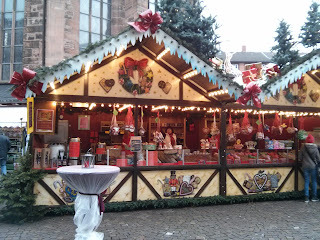 This Christmas market was just a few blocks from our temporary apartment so we started our Saturday by walking over and checking it out. It was a little quieter than we had expected but the village has a great historical feel, reflecting the fact that people have been living around there for over 2000 years. A particularly colorful sweets stand. Gingerbread hearts are a traditional treat at festivals and markets. 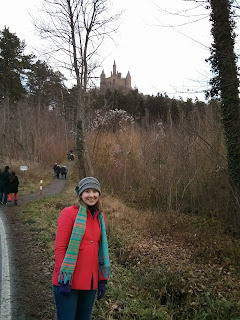 Excited for more, we jumped in the car and drove about 30 miles to a Christmas market in Maulbronn that's held in the courtyard of an 1147 monastery that, according to Wikipedia, is best-preserved medieval Cistercian monastery complex in Europe. Not knowing this going in, we entered monastery courtyard to find an amazing setting, great food, and lots of neat handmade gifts. Looking for a second meal of the day, Kristin spotted these planks with salmon filets roasting by the fire and immediately decided we needed one. We waited patiently in line but as soon as we got to the front, they ran out of fish for that round and told us to come back in 20 minutes. Despite the other temptations, we waited for the next round of fish and showed up exactly 20 minutes later. Kristin is usually pretty aggressive when it comes to lines and I'm pretty aggressive when it comes to food but when one old lady wandered in front of us, we didn't have the heart to call her out. And then she got the last piece of salmon for the round...leaving us again hungry. Instead of more waiting, we settled for Flammkuchen (translates to "flame cake"), which is like a thin pizza crust often with onions, bacon, and a little cheese sauce. Wikipedia tells me this is actually a traditional French dish, native to the Alsace region about 60 miles from Stuttgart. 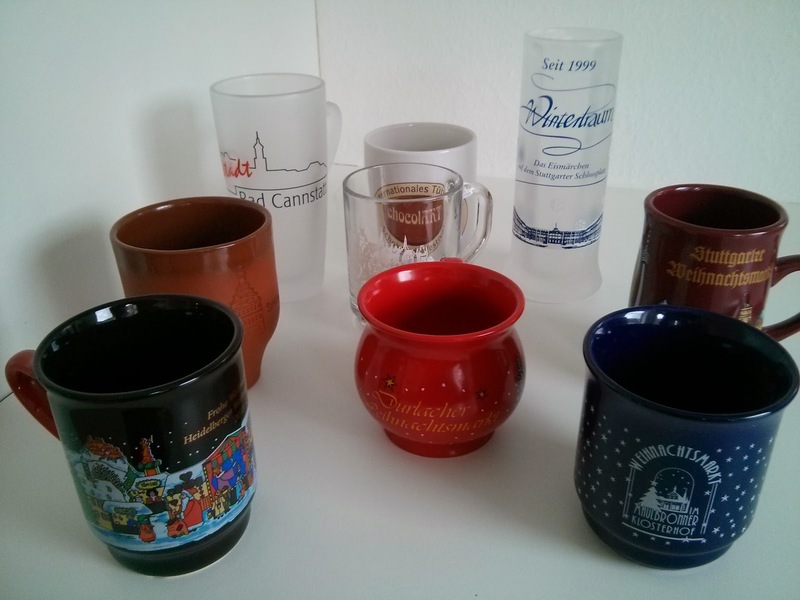 Somebody has to check the local Glühwein to make sure it is tasty. To cap off the day we hit one more market in Durlach. This one has a medieval theme and is in the shadow of their castle in the middle of town. 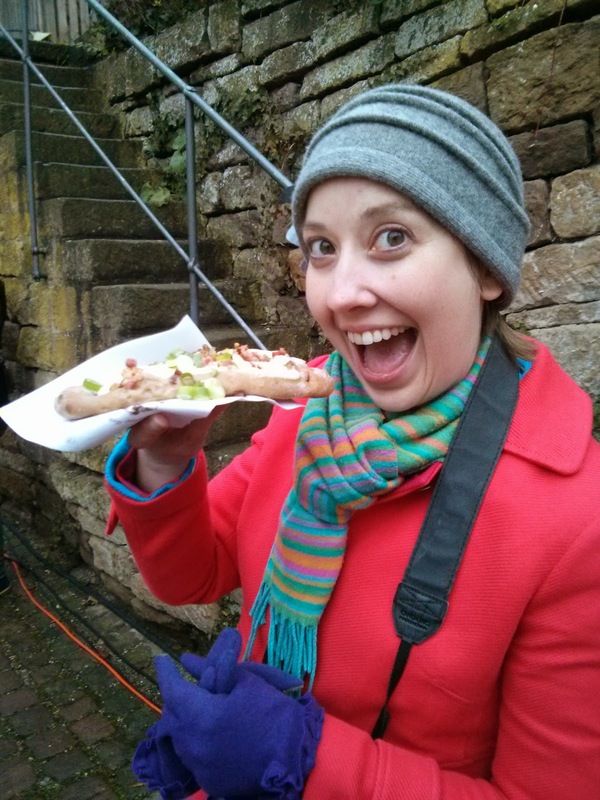 It was pretty small, a little hokey, and it had started to drizzle but this market did provide the best meal of any of the Christmas markets. Two guys had a pig on a spit that had been roasting all day and it smelled awesome. When you order, they just cut off a few hunks and pop them onto a roll to make a sandwich. Add a little mustard and you have some of the best pork I've ever had. Well done, gentlemen...and sorry you have to wear goofy medieval outfits. I was happy with the pork. 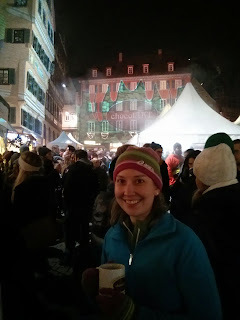 And the Glühwein kept me warm. Sunday morning we woke up with more Christmas (market) spirit and started the day in what could be considered a suburb of Stuttgart, about 8 miles from downtown. Sundays are traditionally a quiet day around here when all of the shops and stores are closed so I think that contributed to this market's sleepy feel. By now we were tired of the traditional market food and were excited to see a stand selling surprisingly good Indian food. The only other memorable thing was a fire where kids were roasting marshmallows but they wouldn't give Kristin any. 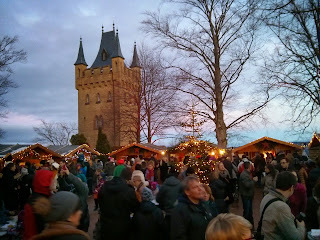 Just as you're probably tired of hearing about them, by Sunday afternoon we were getting a little tired of visiting Christmas markets and debated whether we should hit one more this weekend, knowing the entrance fee was €10/person. The crazy lady whose apartment I rented before moving to our permanent place really wanted to take us to Esslingen's Christmas market because it's her favorite and she wanted her non-English speaking husband to meet us. We actually finished a run in this market but didn't have the heart to tell her we'd already been, and it gave us a chance to actually take pictures. 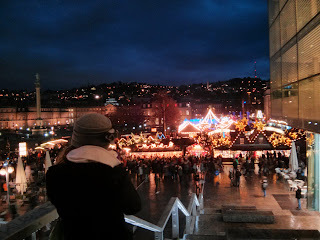 We saved the best, or at least the biggest, for last and finally ventured down to the Stuttgart Christmas market the following Saturday. It's been going on since at least 1692 and is the largest of its kind so we feel fortunate to have it within walking distance of our apartment. Another chilly drizzle can't stop the Christmas spirit! 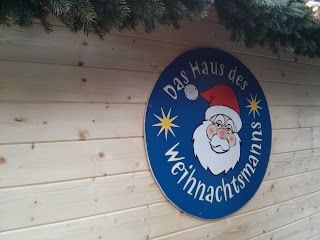 This huge Weihnachtspyramide ("Christmas Pyramid") was on top of the soup and Glühwein stand. I liked it so much I had both! Well, that's it until next year. Cheers! We are excited to announce we have finally picked a place to live in Stuttgart. Our new apartment is in a neighborhood called Stuttgart-Süd. We think it will be a great location, since it is within easy walking/train distance to the center of Stuttgart, and very close to the tunnel out of the city that heads towards Matt's work. So far the commute has been great. There are lots of restaurants, bakeries and grocery stores within walking distance, so we are excited to explore our new neighborhood. There are only two downsides so far: it is a 5th-ish floor walk-up and the parking situation isn't ideal. Hopefully we'll become accustomed to the stairs (and our legs will look like a million bucks) and we can find a nearby parking space to rent (the closest rental spot we've found so far is 5 blocks away and usually we can find street parking that is closer). Here is our living/dining area. Really big. Too bad we only have one chair. Kristin loves the chair -- it's from Ikea and will look familiar to anyone who has previously visited Abby and Jack's apartment. In the interim, Kristin has suggest using the room as a skating rink. Matt has already made us warm fires in the Swedish stove. We haven't figured out how to make s'mores in it yet, but we are working on it. Matt insists he has it all figured out. Kristin is just sneaking marshmallows out of the bags until she's sure he has. We have a great balcony with views of the city and the Stuttgart TV tower (a beloved local landmark). We got a cute Christmas tree for our balcony (which we can hopefully keep alive for next year too). We've really appreciated the notes and cards that folks have sent. They've brightened up the white cabinets! The bedrooms are on the small side, and don't have any closets (a special European quirk), but we're working on creative uses for the spaces. Right now we are using an air mattress until our container arrives next month. It is fun to have to blow up your bed every night. A real treat. We have 1 1/2 baths, which is awesome. We're excited to buy a washer and dryer so we don't have to use the laundry on base anymore! And I'm sure you are all wondering where Matt has put all of his suits and dress shirts. On the stairs up to our apartment, of course! Closet space is definitely going to be an issue ... since we have none. And I'm thinking Matt's creative use of space isn't a permanent solution. We can't wait to have you all visit and see the place in person. Until then, we are toasting our new place together!